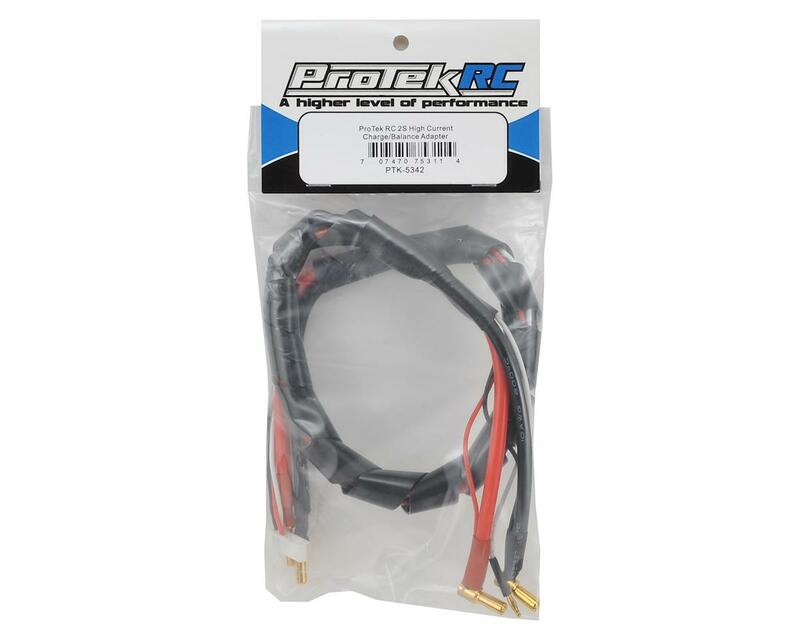 The ProTek R/C 2S High Current Charge/Balance Adapter is the solution you have been waiting for if you charge/discharge your 5mm bullet batteries at higher than normal amp rates, or need a heavy duty low resistance charge cable. 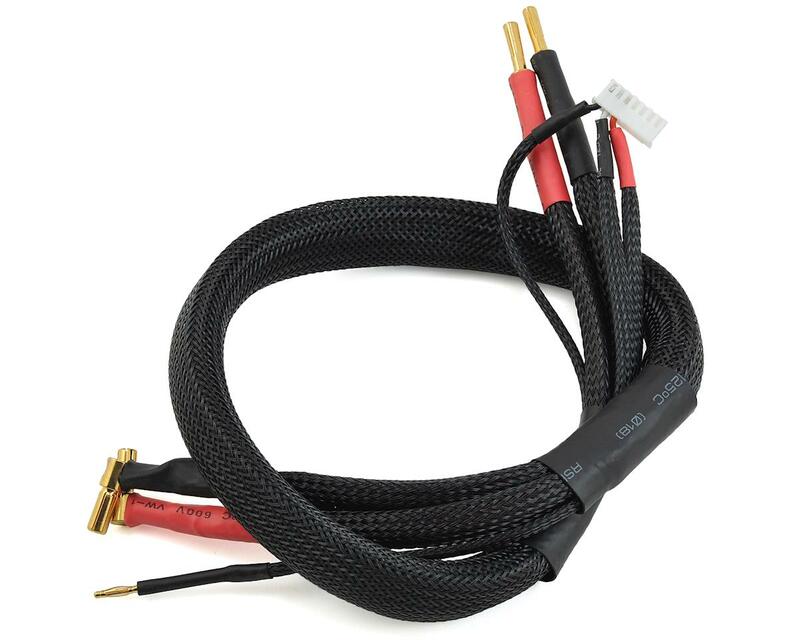 Featuring huge 10awg wire at 24" length, gold plated 5mm bullets for the battery connection and 4mm bullet connectors for the charger connection, with an XH balance tap, this charge cable is one of a kind. The coiled jacket helps to keep the adapter flexible and tangle free and finishes off a package that will keep your work space clean and organized. Great charging leads. had homemade ones before and these are much nicer and less money. unlike the another reviewer I have had no issues with resistance and I run an icharger aswell. The white wire with the 2mm bullet could be longer. I ended up adding a 4 inch extension, so I could plug it into the battery less tension. Tension on the 2mm bullet wire will cause an early failure. Lastly, I use an icharger 406b with this charge lead. When charging the SAME battery with this lead, I am getting 3.4 mOhm per cell. With my home made lead, I am getting 1.8 mOhm per cell. Occasionally, cell 2 will drop to 1.0 mOhm per cell, with the protek lead. So, this leads me to believe there is probably a bad solder/bullet connection on one of the balance wires going to the +/-. For the price is is not terrible. It would have cost me more to buy all the stuff to make this one. I will probably end up redoing the solder joints, so see if I can fix the IR discrepancy with the protek lead. I wish I had listened to the other reviewers, but I wanted a cable with a balance connector with the same number of pins as my charger, so I didn't have to pull out my balance adapter board. The woven plastic covers are over every wire--this is far too much. It makes it very unfriendly to use. The wires are too stiff and the whole thing was way too bulky, as others have stated. 1) Pull the outer woven cover from under the heatshrink tubing and then slide it off completely. Then slide the heatshrink tubes off. 2) Pull the woven cover off the 2 main conductor wires, leaving the heatshrink tubing near the end bullet connectors. 4) Heat the shrink tubing on the end of the main conductor wires since they are now loose after removing the woven wrap. 5) I returned the outer woven cover, but shortened it by about 1.5 - 2 inches. I used the same heatshrink pieces I took off earlier, and heated them again to lock the outer wrap in place. Ultimately, this resulted in a much much thinner charge cable. The outer wrap is now pretty much "normal size." The ends are much more flexible and while the balance cable would still be better if it was another inch or so longer on each end, it is now a usable cable. Previously it was bordering on going in the garbage can. It would be improved further if the cable was overall 6-8 inches longer. The 2mm bullit snapped right off after three charges. Balance cables should be a little longer than the charge leads. The MASSIVE coiled jacket adds tons of strain/tension, feels like plastic sleeves. Disappointed the Protek Prodigy 625 charger didn't come with some charge leads after spending $$$ on it. These charge leads are horrible. I thought at first sight that they looked like high quality leads, but after plugging them in one time I noticed they have a design flaw. The stretch wrap around these cable assemblies is bad for this purpose. This material is used to pull cabing. As you pull on the sheathing it stretches and tightens. May sound nice, but is doomed to fail on the smaller gage wiring (balance leads)using it with shrink tubing at the ends. Not what I'd expect after spending this much for leads. If they don't offer a better option I will be returnign the leads, and charger.